High-end, mainstream virtual reality is coming up on eighteen months in the consumer market at this point, with the launches of the Oculus Rift and HTC Vive early last year and the PlayStation VR in late 2016. Around the time of the first launches, I wrote a piece here about the emerging spread of VR products that existed at that time in two fairly distinct camps separated by quite different pricing, with the higher-end rigs mostly $400-800 on top of either a high-end PC or a console, and mobile VR down at the $100 price point or below. Microsoft and others clearly saw an opportunity in that market to create lower-cost but still powerful VR rigs in-between those two price buckets around that time. But the market has now moved on quite a bit, with recent price reductions squeezing the middle and leaving little room for differentiation where there was once a clear market opportunity. There were two distinct markets at the high end and the low end, and an opportunity at around something like $300 to create a powerful and yet more affordable alternative to the premium PC-based rigs and to some extent Sony’s console-based setup. Microsoft consequently announced that it would have headsets in that price range available through partners based on its Windows Mixed Reality platform sometime this year, and we’re now starting to see those devices announced and available to the public, including at IFA this week. Whereas Oculus Rift’s bundle and the HTC Vive both started at $800 early last year, in recent months those prices have fallen quite a bit, with the Oculus bundle currently selling at $400 and permanently reduced to $500, and the HTC Vive getting a recent price cut to $600. Sony, meanwhile, has dropped the effective price of its core VR system by $50 as part of various bundles. And those Microsoft mixed reality headsets that are starting to debut are mostly coming in higher than that eye-catching $300 price point, with actual prices mostly between $300 and $500. 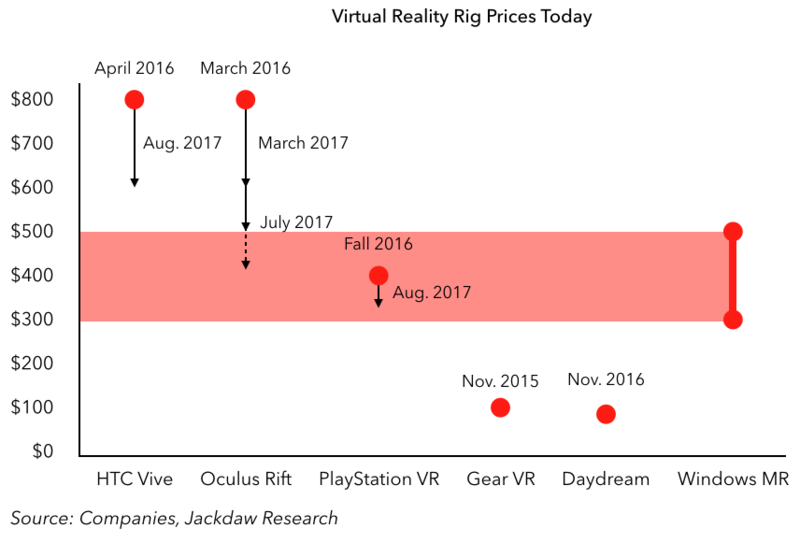 I’ve painted a pink band across the chart above to show how that price bracket compares to the rigs Microsoft originally intended to undercut, and you can see that there’s actually overlap with the current prices of both the Oculus Rift bundle and the PlayStation VR, while the HTC Vive is just $100 more. Of course, Microsoft’s other big price argument is that its rigs won’t require such high-end PCs, offering at least a decent experience on more generic PCs and therefore providing a lower total cost of ownership than HTC and Oculus’s solutions. 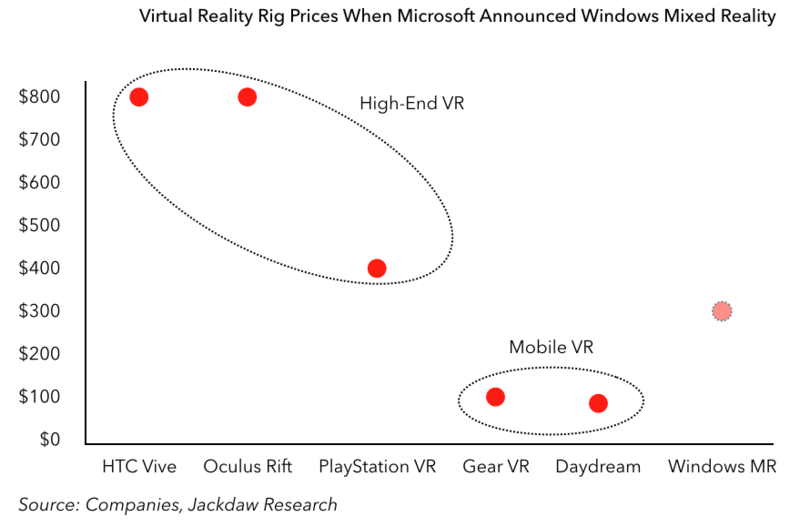 And I don’t mean to pick on Microsoft – others have pitched standalone VR headsets which are intended to sit between the mobile VR and high-end rig prices, but they’re also aiming at that same $300-500 price bracket that’s now being squeezed from the top. All of this is great news for the consumer and for the mainstreaming of VR, at least in the short term: the cost of owning a VR system has never been lower, and the range of content (especially games) available for these platforms is growing all the time. All this will expand the addressable market for VR beyond the 4-5 million that have so far bought one of the mobile or premium systems, probably multiplying it several-fold over the next few years. And yet I have to wonder how sustainable these price cuts will be for the companies: Oculus has always said it sells its hardware at a loss, while HTC was reportedly making a profit on $800 systems but likely isn’t at $600. Oculus’s price discounts may well presage new hardware coming soon which could see the price point of newer systems creep back up, but HTC may have a hard time rolling back its price discounts without new hardware. It can ill afford to sell VR systems at a loss given the company’s overall losses and the state of its smartphone business, hence recent reports that it’s exploring strategic options including a sale or spin-off of the Vive business, which after all has little connection to its phone effort. Facebook can certainly afford to fund ongoing losses for some time to come, but its platform has been the least adopted of the major systems so far, though the price discounts may help change that. Meanwhile, the opportunity in the middle of the market is going to be increasingly challenging because the price differential versus the premium experiences is significantly less than it once was, making life harder for the Daydream, HTC, and Facebook standalone headsets due to hit the market soon as well as those Windows headsets. And of course at the same time the other part of the mixed reality spectrum – augmented reality – is going gangbusters with both major smartphone platforms creating tools for developers to leverage the largest installed base of consumer devices out there. It’s going to be an interesting period for the VR market.